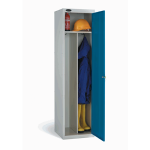 PPE Archives - Shelving & Racking Ltd.
Our Personal Protection Equipment (PPE) Lockers are an effective way to control and store your safety equipment. 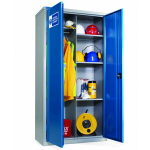 We also have a range of PPE Cabinets to complement these lockers. 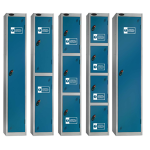 All PPE Lockers come with blue doors and a silver carcass, The single and two compartment lockers come with a top shelf and double coat hook per compartment. We offer a choice of locking mechanisms. Included in the price is a standard key lock with 2 keys or a hasp and staple for use with a padlock. Other options including coin or token locks and combination locks are available at an additional cost. We will contact you after your purchase to confirm your preferences.